A Hollywood special effects artist has turned his hand to eyewear, creating a rather bizarre range of contact lenses. The handcrafted eyewear is the product of the labours of Kevin Carter, who spent days carefully handpainting the lenses, according to the Daily Times. According to the newspaper, he said: "I love horror films so a lot of my own designs are quite scary and creepy. "Artistic contact lenses really have the power to transform faces." 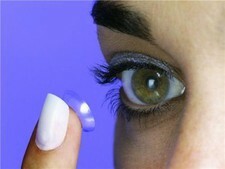 Cosmetics is not the only area where there have been contact lens innovations recently. Last month, University of Akron researchers claimed they have developed a new contact lens that can monitor diabetes, by keeping track of insulin levels for patients. The principle behind the new technology is that the contact lenses change colour to indicate different blood-sugar levels to the wearer. Eventually, researchers are confident that the lenses would be just as comfortable as other prescription lenses available on the market.